One of the best things about cooking is that there’s always something new to explore and always something to improve on. As you can see from the blog, we love finding new recipes and new ways to use familiar ingredients in ways that we haven’t tried before. Celebrating our two year anniversary, we went out to get drinks and appetizers at a seafood-inspired restaurant. Always a sucker for mussels, we got mussels with lemongrass, ginger, and a coconut green curry broth. It was great- a whole new take on one of our favorite things. Which got us to thinking that we need to branch out more with Indian recipes. 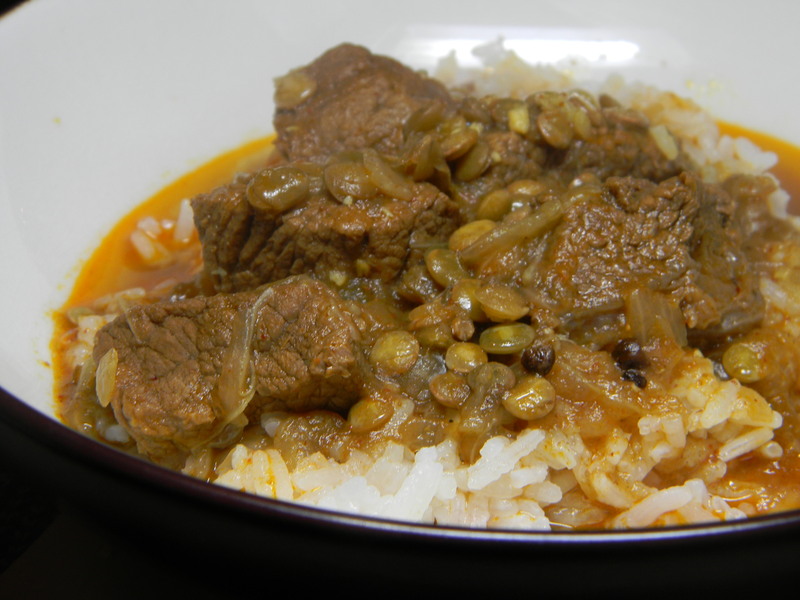 Our friend Kevin recommended this recipe as a great place to start- it actually calls for lamb and yellow split peas, but we didn’t have either of those and had to make do with lentils and beef- it still turned out delicious! Hopefully this will be the first of many Indian dishes this fall as the weather gets colder and our meals get a little heartier to beat the cold outside.